Thankfully, nature – as always – gives us many herbs, plants and foods that can heal and help us, without the harsh side-effects and exorbitant costs of pharmaceutical drugs. And when it comes to treating depression, turmeric is one of these amazing gifts from the Earth. There have been numerous scientific studies which conclude that turmeric might be more effective at treating depression than any of the pharmaceutical drugs on the market. This study provides first clinical evidence that curcumin may be used as an effective and safe modality for treatment in patients with MDD without concurrent suicidal ideation or other psychotic disorders. Turmeric also has many other benefits including supporting thyroid health, alleviating asthma, improving brain function, improving oral health, protecting and fighting against the flu, reversing symptoms of Alzheimer’s disease, preventing heart disease, treating type 1 and type 2 diabetes, treating arthritis and other inflammatory conditions. It has even been shown to be effective at treating and preventing cancer! There are many simple and tasty ways to include turmeric into your daily diet. You can sprinkle it on stir fries, add to greens, use it as a marinate for tofu chicken or meats, add it to your scrambled eggs, or incorporate it into salad dressings. My MasterTonic also contains a healthy dose of turmeric. The natural tonic can be used on salads, stir fries or taken on its own for daily immune-system support. To make the Master Tonic at home, click here for the recipe. Or, if you do not have time or can’t find the ingredients to make this tonic yourself, you can order it from my store here: www.earthiemama.com/store. I have mastered the recipe and infuse every bottle with love! It’s 100% Organic, laboratory tested and clean of heavy metals. Or, you may like to try this recipe for Turmeric Milk. It is so incredibly delicious, with countless healthy benefits. Optional: Add chia seeds, cloves, banana etc. to your liking. Add ice if you would like a chilled drink or heat the mixture slowly for a hearty warm beverage. 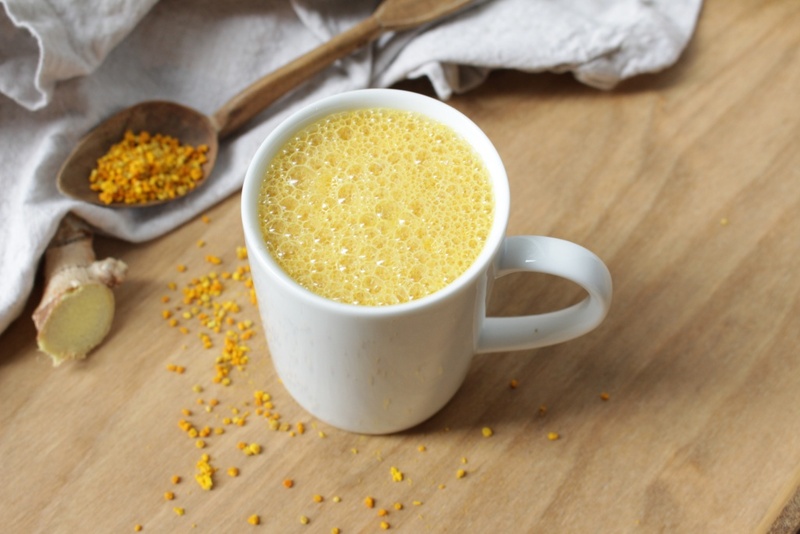 If you come down with the flu, warm Turmeric Milk is an ideal healing and soothing drink.